Surprised? Doesn’t disability make life more difficult and mean you can’t do things? I think many, including myself, have felt that way about disability. We may believe that disability is a burden and those with disabilities are less valued in society, less capable, drain the benefit system, are unemployable and to have a disability would be the end of life as we know it. Well, this may be true for some and gathering three disabilities in my life has been a challenge and I have had to adapt. But what I am saying is that those of us living with disabilities (or long-term health conditions) and those working alongside need to review our own opinions and unconscious bias. Born in the group known as ‘fit and healthy’, I was a sportswoman from an early age, including jumping 1.25m at high jump aged 10, and winning all sprints at inter-primary school events. This ability continued into grammar school where I was selected for individual athletic training and became a key member of our hockey team, representing the school at both. I cycled, walked and competed in athletic competitions up to county level. I captained a successful Ten Tors team and succeeded in all activities I tried. 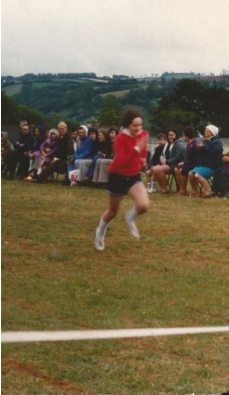 At sports days I gathered a following and rewarded them by lowering the 400m school record to under 60 seconds, a record still standing today. I was fated for great things, but that dream halted at 15 when I became ill and could barely rise from bed. In those days ME (Myalgic Encephalomyelitis) or even ‘Yuppy flu’ were unheard of and although all medics agreed something was wrong it remained undiagnosed for another 20 years. After a year of poor health, I recovered to some degree but never to those heady record-breaking days. 10 years passed, and another undiagnosed episode resulted in retirement from teaching. But still I fought on (you haven’t met my mother, have you? That’s a story for another day). Then, in my 30’s, I finally received the diagnosis of both asthma and ME. These were shocking, depressing and debilitating. I felt my life had taken a turn for worse, I could not fully be a mother, wife or employee. It takes time to adjust and realign your viewpoint. I missed out on my children’s events because I didn’t have the energy when I finished work. I worried my colleagues would see me as a burden and not a valued team member. I kept looking back at what I used to be able to do and was my own worst critic of my current performance. I strived daily to ensure others couldn’t judge my perceived lower level of contribution, often to the detriment of my health. Work/life balance focused more on work with my family receiving the small remainder. I am not alone in this struggle, all those who become disabled have this or similar struggles. Then in 2015, as I felt I was successfully managing my conditions, I was diagnosed with fibromyalgia. Really!? Have I not enough? But by then it is just another disability and I had to buck up and deal with it. Being miserable and asking ‘why?’ wouldn’t change anything. So, after all that, why do I say disability widened my horizons. Well that is about perspective and mindset. I could have just curled up and said, ‘I can’t work, my life is ended’ or I could think life is for living and live it. So, mobility has become limited due to constant pain and my body not working so well but there are advantages to everything in life and I had to look for other interests. In 2013 I took a scuba-diving taster session and loved it. Andy (my husband) and I then took this forward, gaining our PADI Open water qualification and have now dived in the Canaries, Hawaii and Caribbean. 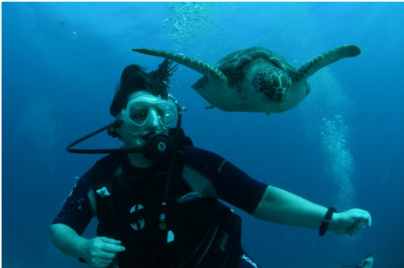 Photobombed by a turtle, I’ve swum with sharks and explored wrecks. With extra assistance on the surface I can dive freely; from 3 metres down I feel no pain. Diving gives me freedom back and during the dive I am no different to other divers, who, like me, are amazed and awed by the beauties beneath the waves. If I hadn’t developed disabilities, we would have continued to pursue walking and sport, but this new skill has been amazing and truly widened our horizons. None of this has been easy and there are times when I ask why or why me? There are still times I grieve the person I could have been and feel judged for the adjustments I need. I am no-one special, just an individual trying to get on with life and everything it throws at me, like everyone else. I just want to say that developing a disability is not the end, just a new challenge. So, when you think about disability, what are your biases? Do you judge an individual by your own perceptions and opinions or do you look beyond? I can, as an individual living with disabilities, be a valued member of ONS, my family and the world in general. I feel privileged to use my circumstances to drive forward change within our organisation. I now need wheels to whizz around Titchfield, with a smile on my face, which really helps even on the days it is a struggle. This has made my disabilities more visible and requires less explanation or justification of any workplace adjustments. Something many with hidden disabilities still suffer. I don’t want pity, or to be judged on first impressions, I just want to be valued for who I am and what I contribute. So next time you think of disability, as an individual with or without a disability, stop and think. We can all be limited by our own opinions and horizons, but we should just push these boundaries. You may be surprised.